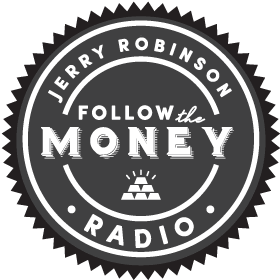 FTMDAILY.COM – On this week’s program, host Jerry Robinson opens up with a brief economic commentary. From Black Friday shopping data and stock market levels, to the state of America’s broken debt-based monetary system, Jerry weighs in on the health of the U.S. economy. Next, enjoy a segment from a bold interview in which Jerry Robinson reveals how corrupt the Federal Reserve is and why it should be ended. Jerry also provides several practical ideas you can implement now in order to weather economic chaos. Finally, veteran precious metals advisor, Tom Cloud, joins the program to provide gold and silver investors with timely market information. Enjoy this week’s podcast and share it with a friend (convenient share links are located at the bottom of this page)! While speaking at the Pike’s Peak Prophecy Summit this summer, Jerry Robinson was interviewed about the the spiritual role of money. In this interview with Derek Gilbert of “View From the Bunker“, Robinson discusses topics that are vital for Christians to understand the current economic crisis and the geopolitical tensions around the world. 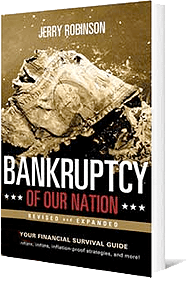 Topics include: petrodollar system, Federal Reserve, and practical ideas to protect yourself against economic calamity.